Shelve those 3-ring binders. Get organized. Download and play something new in seconds. With forScore, the original sheet music reader for iPad, your scores have never been betterâ€”itâ€™s everything you can do with paper and so much more. As seen in Apple retail stores worldwide! From the moment you launch the app, youâ€™ll see how forScore puts your music front and center. Donâ€™t let the interfaceâ€™s simplicity fool you, thoughâ€”forScore has an arsenal of tools ready to help you turn practice into performance. Create links to handle repeats with a single tap, play along to an audio track, and use half-page turns to see the bottom half of the current page and the top half of the next one at the same time, removing jarring transitions once and for all. 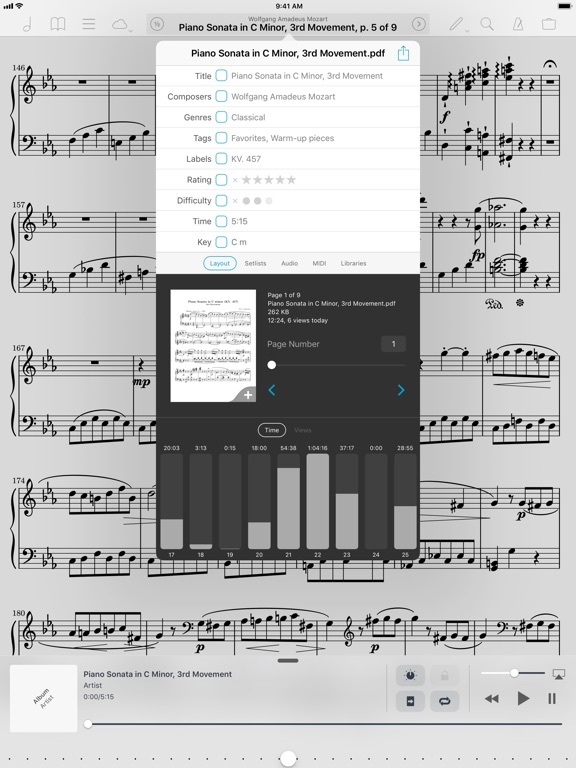 Thanks to forScoreâ€™s ability to import virtually any PDF file from the web and connect directly to services like Dropbox or download your Musicnotes.com purchases, itâ€™s not only the best music reader around, itâ€™s also the worldâ€™s library of sheet musicâ€”just millimeters thick. Keep those scores organized by tagging your files and let forScore do the rest with its dynamic menus that are always up to date. You can also create, share, and play through setlists for a fully manual approach to grouping and arranging your files. And when it comes to annotation, forScore's flexibility is unparalleled. Create and edit an unlimited number of drawing presets, add text to your page with adjustable formatting, and add common musical notation symbols with our unique stamps feature (you can even draw or import your own designs). When you're done, share your files and annotations with friends via email, AirDrop, or print them out with AirPrint! Under the hood, you'll notice forScore's finely-tuned algorithms that use every millisecond of downtime without ever getting in your way. They keep your library organized, make page turns virtually instantaneous, and even learn from you to give you the best possible experience. That's just the beginningâ€”be sure to visit forscore.co to learn all about forScore's incredible features and find out why so many musicians agree that forScore is simply the best.